If you were a young girl in the 80s, you probably do. I remember keeping a close eye on Waldenbooks (remember Waldenbooks?) for new ones, and begging my mom for them. Of course, as a teacher, I realize that they are very definitely the fast food of children's literature. Formulaic, basic, very targeted. But I also understand that they encouraged me into the bookstore and kept me reading. In between installments I could focus on the "good food", but a little taste of junk once a month kept me anxiously awaiting a new book. Anyway, I was thinking about that the other day, because I've realized I have no idea how to find a good babysitter these days. Obviously I'm not talking about the Grandma variety of babysitters. The girls LOVE when Grandma or Gram come over to babysit. But in our PERSONAL situation, Grandma and Gram live 45 minutes away and work full time. They don't pop over so I can go get a haircut in the middle of a Wednesday afternoon. 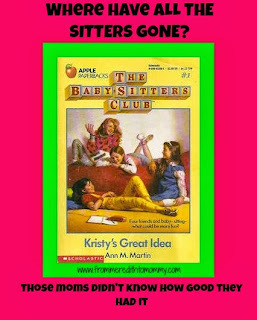 The moms in the books always seemed to have meetings and haircut and errands and appointments that took them out of the house in the after school hours, and they had a collection of sitters who were walking distance away. I used to read these book and be envious of the sitters. Sure, I babysat in middle school, but I had nowhere near the volume of jobs within walking distance. I figured those girls were raking in the dough, filling their after school schedules and having plenty of spending cash. Now I'm envious of the moms. We really lucked out with Sarah this summer. A sixteen year old, who I met through the church nursery, who was completely affordable and a mere 15 minutes away? Jackpot! I counted her as one of my blessings every time she came over. Two afternoons a week, I could write, I could clean, I could run errands, I could make an appointment, knowing the girls were having fun. I knew her, knew the girls liked her, and found her so easily. But Sarah is back in school now, and high school for her is a full time job. Between school, clubs, sports and activities (not to mention piles of homework), she's a busy girl. And somehow, we're starting to have need for babysitters on a whim and I'm praying that a babysitter's club flyer will find its way to our mailbox, so I have host of sitters to call for all our sitting needs - when Grandma isn't available. A chance to make an appointment for myself. A Mom's Night Out on a weeknight when Adam is away. A golf buddy of Adam's suggesting a dinner that night. How do I find a "school year" Sarah? Someone young, fun, affordable, close, reliable and available? I'm stalking the church for teenage girls, but so far, no luck. Please never take that sentence out of context. It sounds incredibly creepy. One thing I know for sure: The moms in those books had it great.